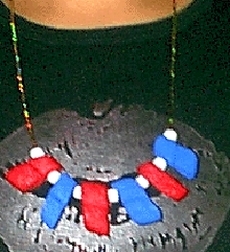 Reuse packing peanuts to make a red, white and blue patriotic necklace. Styrofoam packing peanuts are used to protect items that are being stored or transported; when they are no longer needed, they are often thrown away – but you can recycle some of them with this easy craft project. What you will need is the sort of packing peanuts that have a hole in the side, so you can string them onto a necklace. Craft stores often get supplies shipped to them with this type of packing peanut; if you ask politely, maybe your local craft store will give you a few to reuse for free. Paint all the sides of your packing peanuts in the colors you have chosen and let dry. Cut a piece of twine, yarn or string to the length you will want for your necklace. Remember that you will need to fit the necklace over your head when it is finished, so make it long enough for that, plus a little more to make the knot when you are finished. String on one white pony bead, then a blue peanut, a white bead and a red peanut. Repeat as many times as you like to make your necklace design. Tie the two ends and try on your necklace. Wear the necklace to celebrate Independence Day, Canada Day, or the special day patriotic day of your country. » You could also make packing peanut necklaces in your sports team colors. » If you can’t find packing peanuts, make your own recycled beads from breadcrumbs and glue. just great ideas , genius !!! and thank u for sharing !! !